ART AND SCIENCE AND TECH, OH MY! Who do you see when you think about entrepreneurs and philanthropists? Here at Balmoral Hall School, we see nine- and 10-year-old girls striving to make a difference however they can. Junior School students are eager to experience the Centre for Arts & Design to their fullest potential. ; in fact, a few of them are so eager that they gave away their profits from a recent commercial marketplace, all to support the wish list. For example, a team of three Grade 5 students, Stefanie, Emily, and Ayla N., started S.E.A. Bath Products, making bath bombs, salts, and bar soap. In mid-March, Ms Borodkin and Mrs. Mitchell coordinated a marketplace in the atrium. Afterwards, students took a vote to determine which of three local organizations they would direct a donation to, and a majority chose the Centre for Arts & Design. “I saw the banner around the school of things that they still need, and so I thought, if they still need some more stuff, maybe we could help contribute to it,” remembers Ayla. “We are anxious to get in, to see it, and to use all of the cool equipment,” Stefanie adds. By donating their earnings ‒ $348.75 ‒ to items from the Centre for Arts & Design wish list, including a stool (for one of the drawing tables) and a ukulele, their peers will benefit from their generosity. To them, their education matters. Thank you to Junior School Entrepreneurship Club members for your generous support of the Full STEAM Ahead campaign! I would like you to know why my family chooses to support Balmoral Hall School through charitable giving. My wife Gisèle and I have two daughters; Mia is a Grade 12 student and lifelong BH girl, and Katelyn, also a lifer, graduated in June. She is in the process of writing her first exams at Queen's University. When we think about how well she is adjusting to university life – as she is just beginning to realize her true potential – we are proud that she received a top-notch education at Balmoral Hall. We have the school community, our BH family, to thank for this. Teachers and staff genuinely care about our daughters. Generous donors – parents, grandparents, and alumnae – show their support, year after year, for programming and resources that are not available anywhere else. Mia's interest in technology is guiding her pursuit of post-secondary studies in computer science. The tech she has access to at Balmoral Hall has created unique opportunities for her that are only possible thanks to past and current donors. As the Chair of the Advancement Committee of the Board of Governors, I support efforts to create a culture of philanthropy at Balmoral Hall School. Gisèle and I share our values as community-minded parents with our daughters. They each support their class funds however they can so that future students will prosper, too, with the help of scholarships and bursaries. As a family, we have given to the Centre for Arts & Design annually since fundraising efforts began two years ago. Even though Katelyn will, and Mia might, never experience the Centre for Arts & Design, we understand the importance of fostering creativity through enriched learning in science, technology, engineering, arts, and mathematics (STEAM). We are proud to support innovation in girls' education, and we eagerly await the grand opening in a few months' time. If you, like us, are excited by the thought of paying it forward, then I ask you to consider Balmoral Hall School as you make your charitable giving plans this holiday season. Thanks, in advance. The soil turning beneath me has been stood upon by thousands of students passing through on their academic journey. Generations have witnessed the changing seasons here, green grass covered in falling leaves and then snow, only to sprout again. Something else grows here now, from a sturdy man-made foundation, steel that stretches three stories high baking in the bright summer sun. Fall arrives, and I'm blanketed in concrete. The wind whistles through me, but – wait – glass surrounds me now, drawing a little heat from the dim winter sun. I bask in its glow, and something rumbles to life inside of me. I have power. I gain strength. Hollow spaces are filled with possibilities that I dream of at night when it's so quiet I can hear the river ice cracking. When I open my doors wide, the pitter patter of footsteps will echo inside. Hushed whispers and booming laughter will stir my soul. Just think of the wonders I will hold! 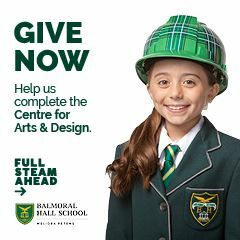 We feel that it is important to give back to Balmoral Hall School. Generosity is a value that we share as a family, and we believe in meaningful contributions like a monthly gift that supports our daughter’s learning. When we enrolled her in 2014, we became monthly donors. One of the initiatives we have supported from then on is Birthday Book Club. We love the idea that she can choose a book for her birthday, while helping the school library to add to its collection. Once we had discovered the exciting plans for the new Centre for Arts & Design, we decided to direct our monthly gift to that priority project during a five-year period. We are certain that our daughter will benefit from an enriched educational experience, as will students for years to come. We want to have an impact in preparing them for careers that may not exist yet. Considering the dynamic, hands-on learning environment that the Centre for Arts & Design will provide, the possibilities are remarkable! Month after month, year over year, we know that our contribution allows us to make a difference. Giving back matters to us. That’s why we choose to remain involved in the school community. Thank you to Andrew Gandier & Stacey Grocholski, Past President of Balmoral Hall Parent Association (BHPA), and a member of our Board of Governors, for your monthly support of the Full STEAM Ahead campaign! It’s important to us that we support what we believe in. As a family that believes a balanced education is the foundation for a better future locally and beyond, we choose to support current and future BH girls in their varied areas of interest. Students will benefit from the learning opportunities to be offered in the Centre for Arts & Design. The thought that our gift will help students explore their interests in this ever-changing, fast-paced era of innovation is what compels us to give. By supporting the campaign, we hope to enable them to strive for and achieve success throughout their academic journey. It’s our way of giving back to the school community that gives us such joy. Thank you to Head of School Joanne Kamins and husband Rod for their generous support of the Full STEAM Ahead campaign. Balmoral Hall School is pleased to offer a naming opportunity of a space in our new centre in recognition of their leadership gift. Leading the Full STEAM Ahead campaign, The Richardson Foundation donates $1 million. Girls’ learning in science, technology, engineering, arts, and mathematics (STEAM) is a strategic priority at Balmoral Hall School, and we are pleased to announce that the Richardson Foundation shares our commitment to supporting student innovation in these subjects. The Richardson Foundation Board of Trustees proudly expressed their support in the developmental stage of Balmoral Hall School’s Centre for Arts & Design through a $1 million dollar-for-dollar match of donations from Richardson family members and personnel from James Richardson & Sons, Limited who have a connection to the school. The Richardson family and Foundation have a long history with Balmoral Hall School, having supported numerous projects and initiatives including the construction of a new gymnasium and the expansion of the school’s athletic facilities. Because of that early support, the second $1-million gift in the school’s 117-year history, we were able to unveil building plans to our school community in Fall 2016, confidently launching our “Full STEAM Ahead” campaign to raise the final $3 million needed to fully fund the $6-million project. To date, 80% of funds have been raised, and, in partnership with Verne Reimer Architecture and Manshield Construction, work began earlier this year. The Centre for Arts & Design is expected to open in Spring 2019. Girls’ learning in science, technology, engineering, arts, and mathematics is a strategic priority at Balmoral Hall School. The Centre for Arts & Design will support students’ interest in STEAM. This $6-million building project, the most ambitious campaign in school history, is possible thanks to a culture of charitable giving. In Spring 2014, we asked Balmoral Hall Parent Association (BHPA): Are you with us? Today, we are pleased to share their enthusiastic response, a pledge of $250,000 committed in Fall 2016 with unanimous support from executive and council members. One generation after the next, the parent association has demonstrated its steadfast belief in the mission of Balmoral Hall. Aligning their efforts with the school’s strategic priorities, their generosity, in giving their time, talent, and trust, along with a lead donation to the Centre for Arts & Design, is proof of their commitment to building an unlimited learning community. Independent schools do not receive government support for capital projects. We rely on the generosity of our parents, grandparents, alumnae, employees, and friends. Every gift makes a big difference. DECEMBER 13, 2018: REDUCE TAXES OWING, MAKE A GIFT!